Red-eared sliders are sometimes colloquially referred to as silver dollar turtles, as babies of this species are around the size of a dollar. If you're thinking of getting one as a pet, bear in mind that your adult specimen will be much bigger than a silver dollar. Also know this: It's illegal to sell or otherwise commercially distribute turtles under 4 inches long in the United States. While red-eared sliders are only native to central and eastern areas of the United States, plus a small part of Mexico, they have been introduced to several other parts of the world. Wild populations of this species exist in many countries, including China, Canada, Thailand, Cambodia, the Netherlands, Spain and Israel. They generally live in shallow freshwater habitats, where sunlight and vegetation are abundant. These turtles can live for up to 30 years. Although they're mostly aquatic, red-eared sliders have legs rather than flippers. These four legs have long nails, possibly slightly lengthier on the front feet and on males. They have hard shells, or carapaces, that are oval in shape, highly domed and well-keeled. Their under-shells, or plastrons, are unhinged. Only their legs, tails, long necks and heads extend out from their shells, but they're able to retract their heads, necks and legs back into their shells for protection. While males and females are similar to look at, you'll notice that males have much longer tails than females. 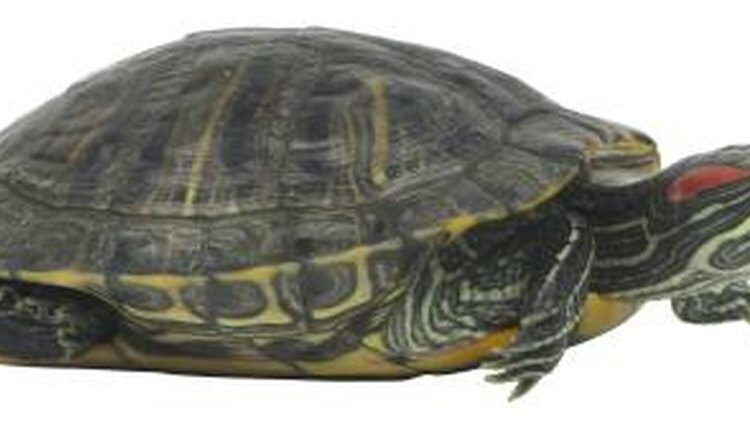 Red-eared sliders have olive-green, brown or black carapaces, with some yellow streaks or eyespots. Males are often darker in color than females and juveniles of both sexes are more colorful, with brighter green shells and more yellow markings. Their plastrons are yellow with some darker markings. Their skin is green with yellow stripes visible all over. The red markings behind each eye are what give these turtles their common name. While hatchling red-eared sliders are roughly an inch long, thus gaining them the colloquial name "silver dollar turtle," adults tend to measure around 12 inches. However, males of the species are around 20 percent smaller than females and tend to measure less than 10 inches long. It can take them some time to reach their full adult size, but males reach sexual maturity when they measure between 3 1/2 and 4 inches -- at around 2 to 5 years old -- and females when they measure between 6 and 8 inches, at around 5 to 8 years old.